Being myself Cuban and having been foreing resident for almost 10 years, i pay special attention to the process of integration and adaptation of migrants.The uprooting, the notion of identity, and the reconstruction implied in a change of culture are recurring themes in my qork. I am particulary interested in the situation of the Martin family because it seems to me revelatory in some aspects of the present Cuban situation, as well as of the decadence of the Western world. As I have come to the conclusion through personal investigations that both parties have committed errors and share responsibilities, the purpose of the documentary goes beyond questioning the implication of the political or humanitarian organisations: I intend to show a process full of hardship, disappointment and will-power.And I also wish to analyse, through the ways this family act, the inheritance of a paternalistic communist regime, its failures and its successes. Between 2010 and 2011, about a hundrer Cuban political prisoners and their families arrived in Spain following a convention signed by the governments of both countries, with the mediation of the catholic Church. This convention stated that those prisoners of conscience would be liberated; in exchange they should be deported from the island. Carlos Martin, a cuban prisoner reaches Spain with seven family members: Sabina ( sister,45years), Ramon (step-brother, 46), Julia( mother,71) Carlitos ( son, 25) Yandri (nephew, son of Sabina and Ramon, 20), Yixi ( Yandri's wife, 15) and Ineibis (niece, 13) After two months spent in a "Welcome Center" the family angered by the living conditions, begin a hunger strike. 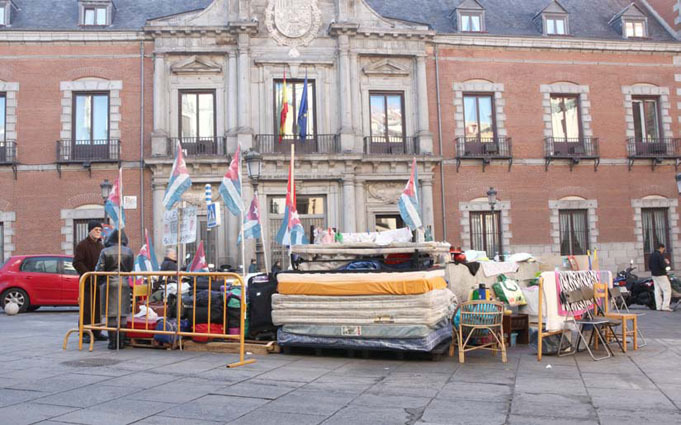 They demand from the authorities a private home, jobs and economic help, which were the promises stated in the convention. The autorities of the center, then, considering their behaivour inapproriate, decide to explulse them from the center and from the help program for refugees.Once in the street, the family ask the Ministry of Exterior Affairs for help, but neither the latter or any other organism agrees to take up their case. Without any place to go, the family decide to camp in front of the Ministry. Today, they have been living there for 7 months. Sabina - the head of the family- has set up, through strict disciplin, an organized routine wich allows them to maintain a certain order and dignity: three warm meals a day, obligatory shower and clean clothes, prohibition of alcohol, and daily school attendance for the girls.They maintain an extremely active social life and avoid any kind of illicit behaviours, but they do not succeed in integrating themselves in society. As products of the communist regime, the family are suddenly facing the world of capitalism of wich they ignore the codes of entry.This film intends to depict the painful and complicated process of uprooting, as well as portraying some aspects of present Spanish society. The "house" of the family is like a small island in the middle of the square. This image will frequently occur in the documentary because it helps to contextualize the situation in the urban space and provides a metaphor in relation with the isolation of the island of Cuba.The camera will be held close to film sitations of daily life and "on the shoulder" to allow greater fluidity; but il will provide non agitated image in order to compensate the wealth of movements and actions of the caracters, always leaving an“hors champ“ space. The caracters will be filmed both in groups- to allow understanding of the way they relate to one another - and separately - to outline their personal conflicts. There will not be any interview facing the camera: in order to more deeply enter the individuality of each, I am planning to use recordings of teir comments in voice-over. The pictures and the direct sound will not be treated artificially or with complementary treatment. Meeting people interested in the project who help making it come true. This project is the result of 4 months of investigations and preparation. The trust and complicity I gained from the Martin family will alow me to approach the subject from inside and to achieve the project in depth.